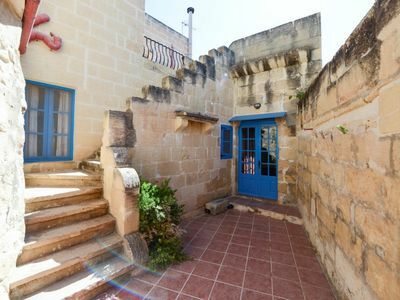 Tan – Nahla Farmhouse is situated in the village of Xaghra in Marsalforn Road, in an alley on the way down to Marsalforn bay. It provides a beautiful country view. 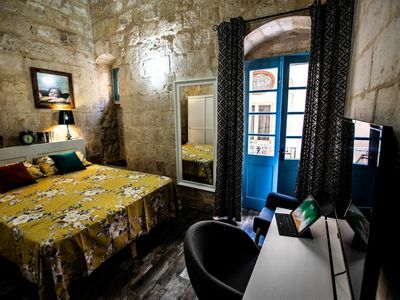 Tan-Nahla farmhouse can sleep a maximum of 6 people, in 2 separate bedrooms which are made of 1x double bedroom and from an outside stairs to 1×4 single bedroom. All bedrooms are fully furnished with red deal furniture and have air condition with en suite. This farmhouse offers a combined kitchen and living room. 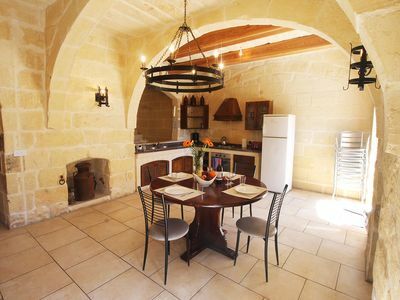 The Kitchen is fully equipped thus providing a kitchen with oven, fridge with freezer, electric kettle, toaster and all the other necessary utensils. The living area is made of a comfortable sofa, table a T.V., log on fireplace and ceiling fans. It also has a guest toilet with shower. This rustic farmhouse offers a very spacious sun terrace with garden furniture overlooking the quiet nice area of the country view. A major feature in this farmhouse is the private pool with shower, sun beds and built in BBQ surrounded with bamboo fence to give that exotic look! The Pool size is approximately 19x12ft. All our farmhouses offer other services that are included in the booking price; 1 baby cot, changing of linens weekly and extra folding beds upon request. There are other services available which include an extra charge; gas /electric heaters and maid service.